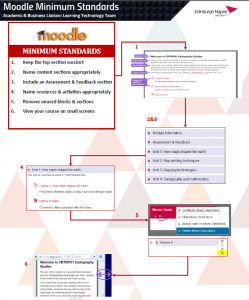 The Moodle minimum standards guidelines have been development in collaboration with Edinburgh Napier University academics and students. They are designed to guide you in creating a Moodle environment that is well considered, consistent and accessible to all students, and in so doing it provides you with the support to better manage your Moodle modules. Full details of the standards can be found on the staff intranet and include a number of short help videos. Update for session 2018/9: It is strongly recomended that modules include a reading list using the Leganto plugin. See the Library eResources page for further details. View your course on small screens. View this full description (PDF) and contact your Learning Technology Advisor for support with implementing the minimum standards and for general guidance on technology enhanced learning.